As fear psychosis has gripped the minority community following the killings of BJP leader Anil Parihar and his brother Ajeet Parihar in a terror attack, prominent Kishtwar residents approached the Central government to take some immediate steps to restore confidence of people. 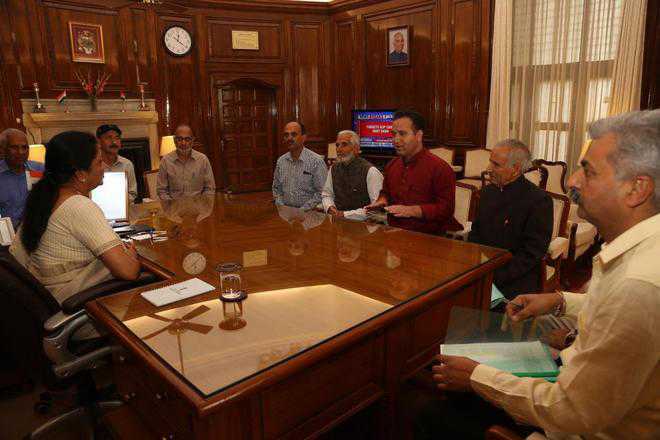 After meeting Union Home Minister Rajnath Singh on Tuesday evening, members of the minority community on Thursday afternoon called on Defence Minister Nirmala Sitharaman to seek her intervention to fulfil their long-pending demand of setting up an Army cantonment at Kishtwar. The delegation was led by Sanatan Dharam Sabha president Hans Raj Bhutial and comprised members of the minority community, including BJP MLA Sunil Sharma. Sources said the minority community had lost faith in the local administration as the police had failed to take steps against the revival of militancy. “On Monday morning, a delegation left for New Delhi to meet Central ministers,” a source said, adding, “members of the minority community are still camping in the Capital to brief other senior BJP leaders about the prevailing fear psychosis in Kishtwar district”. BJP MLA Sunil Sharma told The Tribune over phone that the delegation had demanded handing over of the case to the National Investigation Agency (NIA). “The Home Minister has assured us that those involved in the killings would be tracked,” he said, adding that the delegation told the minister that the situation in the area was like early 1990s when militancy was at its peak in the region. “The Defence Minister assured us of pursuing the proposal of setting up an Army cantonment in Kishtwar,” Sharma said, adding that the process would be started shortly. “The Union Home Minister was also briefed that militancy was again spreading in the region due to the disbanding of special operations group of the police due to political reasons,” Sharma said. The plan to again set up village defence committees was also discussed, he said. On November 1, Parihar brothers were killed by unknown gunmen in Kishtwar town. A day later, the police had constituted a special investigation team to probe the case. On November 5, Governor Satya Pal Malik had admitted that the killings of Parihar brothers was a terror attack. A complete shutdown was observed in Kishtwar on Thursday over the killings of BJP leader Anil Parihar and his brother Ajeet Parihar by unknown gunmen last week. In a joint call by the Sanatan Dharam, Chenab Valley Traders’ Association, Kishtwar, Beopar Mandal, Kishtwar, and Majlis Shora Committee, Kishtwar, all shops in the district remained closed.